British Columbia Government interventions in real estate are cooling the market - how much success is enough? Government interventions in real estate are cooling the market - how much success is enough? A real estate sign is pictured in Vancouver, B.C. on June 12, 2018. It seems she got her wish. 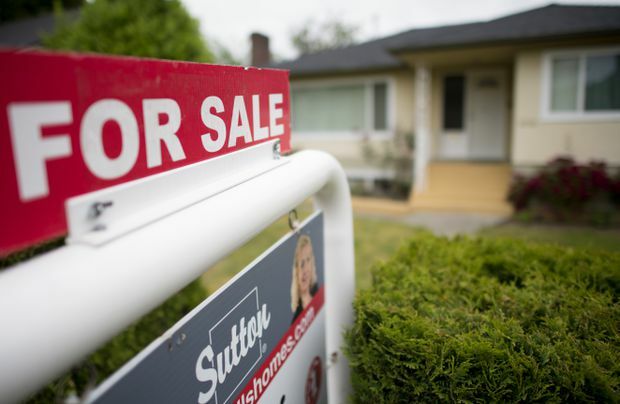 As of January, Vancouver area home sales have plunged by 39 per cent from 12 months earlier. Over the past six months, the benchmark price for single family homes in Greater Vancouver has decreased by more than 8 per cent. It’s an encouraging sign, Ms. James said last week, that shows her plan to tackle the housing crisis is heading in the right direction. “We’re starting to see home prices moderate in all segments of the market, particularly Greater Vancouver, including condos and townhomes,” she said in a statement. But not everyone sees this as a success. The market has experienced a “serious and abrupt change” over the past year, said Cameron Muir, chief economist of the B.C. Real Estate Association. But he doesn’t blame the provincial government. “The B.C. measures are largely window-dressing,” he said. While the province has imposed a speculation tax and other measures, he believes Ottawa is responsible for driving down the market. In January, 2018, while Ms. James was getting ready to send her last budget to the printers, the Office of the Superintendent of Financial Institutions imposed a new stress test for mortgages. Under the new rules, borrowers who want a new, uninsured mortgage must demonstrate they can juggle payments at rates two percentage points above what’s being offered by a lender. Realtors want Ottawa to modify the stress test. “If it succeeds in driving the market much lower, you are putting many Canadians under water who have bought in good faith,” Mr. Muir warned. On Friday, federal Finance Minister Bill Morneau met with business leaders in Victoria. He emphasized that Canadians are still swimming in too much household debt, and said the stress test is helping by bringing skyrocketing house prices back to earth. While the federal and provincial governments seem satisfied their policies are bringing relief, the downturn will have an impact on the budget that Ms. James will deliver on Feb. 19. In recent years, the B.C. government has reaped successive windfalls from the froth in the real estate market. Revenues from the property transfer tax have taken a hit in the current fiscal year. The forecast of $2.2-billion from the tax on home sales has been trimmed by $400-million so far, and that’s just halfway through the year. Jock Finlayson, chief policy officer of the Business Council of B.C., said Ms. James should be bracing for greater losses ahead. He said there are many factors for the changes – the province’s measures, the new mortgage rules and higher borrowing costs. But he said none of it is really helping restore affordability to the market for first-time homebuyers. Curbing demand through taxation and lending policies is only part of the solution. What is needed is more supply, and he said it is local government that holds the key to getting new homes built. “But this requires strong action and significant behaviour change at the local government level, and there is not much evidence that Victoria is pressing for any of this,” Mr. Finlayson said. Both Ms. James and Mr. Morneau have budgets coming in the next few weeks. Watch for more money coming to tackle housing supply.